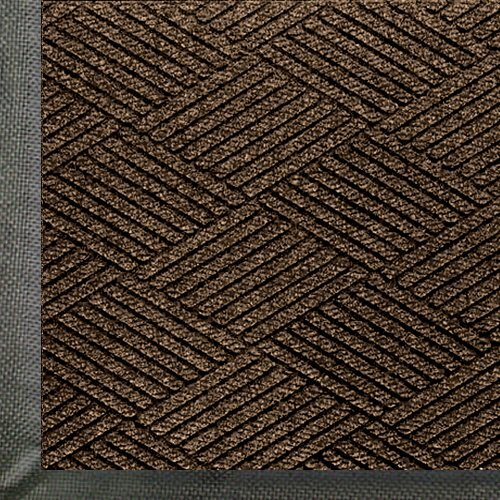 Andersen WaterHog Eco Premier entrance indoor/outdoor floor mat. When the application calls for outstanding performance and beauty, WaterHog Eco Premier is the answer. WaterHog Eco Premier mats combine all of the performance of the original WaterHog with a unique diamond face pattern creating the ultimate visual appearance. WaterHog Eco Premier mats feature a 100 percent post consumer recycled PET face that is reclaimed from plastic bottles. Every 3x5 diverts approximately 60 plastic bottles from landfills. A multi-denier fiber construction combines thick fibers for scraping with fine fibers for wiping, providing better performance and longer life. The backings of WaterHog Eco Premier mats is made of 100 percent rubber with 15 percent to 20 percent recycled rubber content. Face NUBS are reinforced with rubber to resist crushing, maintaining high performance and extending product life. Border is designed to hold water and dirt on mat to minimize slip hazards and floor damage around perimeter of the mat. Removes and traps dirt and moisture and holds it on mat below shoe level so it is not tracked in. Gripping action minimizes movement on most carpets and improves traction on hard surfaces. Lays flat, won't crack or curl like vinyl mats. Durable PET polyester face suitable for indoor or outdoor use. Easy to clean, just vacuum or hose off and hang to dry. Colorfast, solution dyed for excellent light and wet fastness. Not adversely effected by salt or ice melt. Should not be used in areas exposed to animal fats (kitchens) or petroleum products.